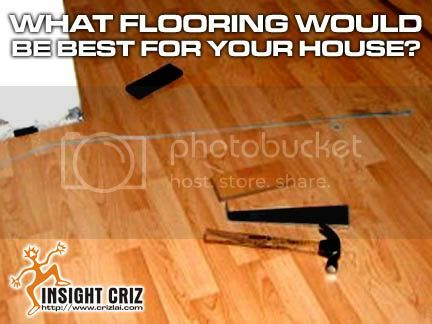 WHAT FLOORING WOULD BE BEST FOR YOUR HOUSE? When someone mentioned about home renovation, the first thing that would come into anyone’s mind would be tearing down of walls, expanding a room or the house. Have you ever wonder maybe it could just be the changing of floor in the house? With the advancement of technology, almost any type of woods such as bamboo, oak, cherry, walnut, taun, jatoba, ash, maple and many more have been engineered to a multi ply designs to look unique with impressive durability and resistance to expansion, moistures, and temperature changes. If you are a person who wants to be a step nearer to nature with the wonderful richness and homey feel, then wood flooring would be your ideal choice. Nowadays, you have so many options of wood flooring in the market and some even came with adhesive sides for easy do-it-yourself custom styling. Most of us would love to have a new look to our home but ended up quite reluctant to make the changes due to high cost of engaging someone to do the job. It’s actually quite easy to work on the flooring if you know the way to do it. Let me share with you how to get the best of your boardwalk. Firstly, remove the baseboard and clean the floor thoroughly. Starting in one corner, arrange the trim-to-fit wood tiles randomly but in a pleasant manner. As some wood flooring may expand and contract with the weather, leave a 1/4 inch space around the perimeter of the room. Use a spacer for consistent distance between tiles. In case you need to trim some of the tiles, a sharp bladed saw will do the work. Now you are ready to create your own wood flooring. From a far corner of the room, start sticking (or gluing with recommended glue in case those wood tiles do not come with adhesive) the wood tiles by gluing next to the previous one and work your way out of the room. Allow the glue to dry before moving into the room to add in more transition pieces to merge one type of flooring to another at your doorway. Bingo! You have your new wood flooring now!